I'd been shopping in town with Jack, picking up some Christmas presents and a few groceries and we were sat in traffic trying to get home. We'd been sat for a while. The two cars in front of were waiting to get into the car park but couldn't because the car in front of them was sat in a queue going round town.... I had my hand break on we'd been sat for so long. The car jolted, me and Jack bounced in our seats and our heads slammed against the headrests - so glad we have those! The car radio jumped out of the dash! Luckily I had the good sense not to have pulled up too close to the car in front so we didn't shunt into them. Jack asked what had happened and I said we'd been hit by a van. I told him to stay put while I went to talk to the other driver. He was reasonable. First thing he did was ask if we were OK, then said "I couldn't see, the sun was in my eyes". I half smiled and gestured to my sunglasses "That's why I wear these," I explained. Winter sun is treacherous. We inspected the damage. His van looked a bit dented but not too serious. Cosmetic damage only. My car however.... "Oh heck, that's a write off I'm guessing" I said to him. He nodded. "Me too" he said. We exchanged details. He's a council worker, in council uniform and a council van. I just renewed my insurance 10 days earlier. It should be simple enough to sort. We shook hands and he drove off, I called for recovery and let Hubby know what had happened. It was an hour and a half before recovery could fetch us, so me and Jack sat in Wetherspoons out of the freezing cold and had a soft drink each while he played Angry Birds and I messaged my folks. Recovery showed up and brought us back to the local garage. I loaded up the pram two times with shopping and kiddy car seats etc and trudged home with them. Then I called the police to report it (who weren't interested as no one had been injured) and then the insurance people. Can't believe the hassle this is causing us so close to Christmas. And my poor car........ 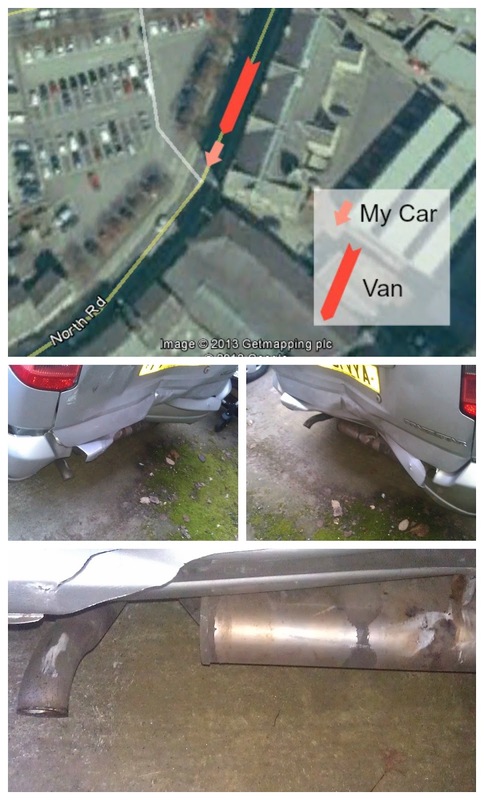 The insurance think it might be a write off too, but it will depend what the garages have to say about it.